Worship the Sun God in all his might and divinity in this spectacular rural village of Katarmal. This hamlet is safely tucked away in the lap of the mighty Himalayan ranges and cradled by the amazing scenic wealth of the Uttarakhand region. In the 9th century BC, a great King who goes by the name of Katarmalla built this temple to show his veneration to the Sun God. Katrmal Sun temple roars the architectural prowess of the Katyuri Dynasty, the mighty regents who ruled the land in the ancient past. Pack comfortable clothes and dress accordingly to the season whether it is summer, winter or the monsoons. Keep some change in your hand to buy some local favorites which you will get in plenty. You can hire a local guide if you insist on knowing some of the glorious history of the place. Trek to the temple from Almora as this makes for a wonderful experience filled with winding paths twisting turns and steep climbs all along the ancient Kausthiki River. The entire valley also provides for a challenging yet charming trekking expedition with plush dales and tall alpines. Indulge in the taste of local favorites like Bal Mithai and Singauri. Make sure you get a taste of the local culture of the people and the entire Katarmal Valley. I personally would not suggest a guide here. It is not that hard to find out. But if you insist on having one then I would suggest that you avail one from the Almora Tourism Office. This is the safest option rather than picking someone local from the city itself. Come summer and the plush dells of Almora sing and dance with such happiness and life that you just can’t resist the temptation. The peak season in Almora is from March to November and the place welcomes tourists with such charm and cheer. You can book a train to Kathgodam or KGM Railway Station and from here you can avail buses to the city of Almora which is only an hour’s drive away. You can also hire a cab from the city to the village of Katarmal, if you want some privacy. 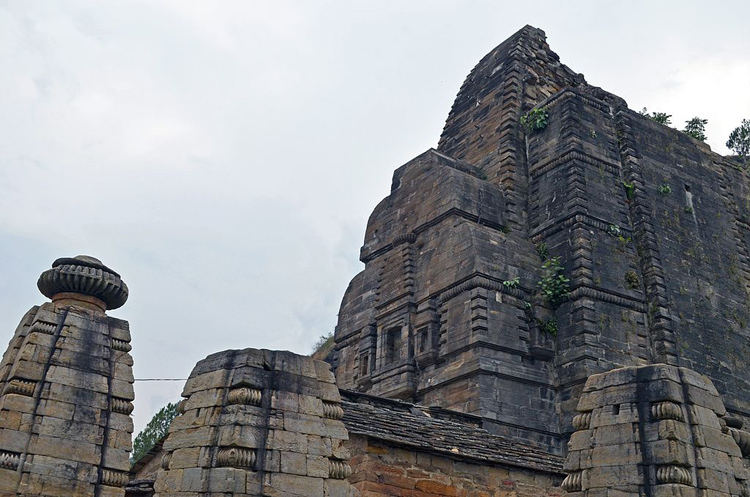 The temple was erected in 9th century CE by the Katyuri Dynasty who then reined the land. It is believed to be built by King Katarmalla; hence the name Katarmal Sun Temple. Located at an elevation of 2,230 meters, the temple is only a mere 12kms from Almora and this makes for a wonderful trekking experience. The main deity of the temple as you can guess is the Sun God, known as Burhaditya and Vraddhaditiya which is installed in such a strategic position so that the first rays of the Sun hit the idol once a day every year. This rare occasion is a much celebrated event at Kartarmal Temple. There are at least 44 temples surrounding the main shrine- all dedicated to the various deities in Hindu mythology. Unfortunately, a robbery in the temple complex shed light on a grave situation. The valuable and ancient relics from the temple were then moved to the National Museum in New Delhi for safe keeping. It is important that you know the legacy of your culture. Your past is a part of your identity and you have to pay respect to it. The Katarmala Temple is more than a tourist spot and it is a vital part of that legacy which roars the rich cultural antiquity of the country.